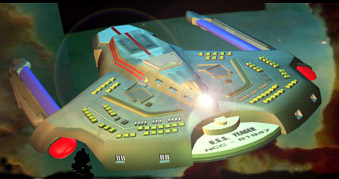 This is the Starfleet Hopper, the Entire Design is mine, I created this for the Starfleet Missions Series, you can see the 2D version in EPISODE I. This was a pretty easy model to make, the textures took longer than the actual model. This is THE most detailed model I have ever made to date. Its in 2 versions - DXF and COB (Truespace), Beware, the Unzipped DXF is 30MB! I would have at least 32 MB of Ram to load this Sucker too.. The Truespace version is Textured, the DXF is not..
Max Conversion By Mateen Greenway - Visit His Website too! This took 7 hours on and off to make, and I will update it again soon to make it even better! The look of this ship is really cool, I had fun making this one.. the textures are really detailed too.. Didn't take long at all to make it either! Download either the Truespace Version, or the Untextured DXF. Conversions to Lightwave are Welcomed!